I was particularly impressed by how the room was designed. 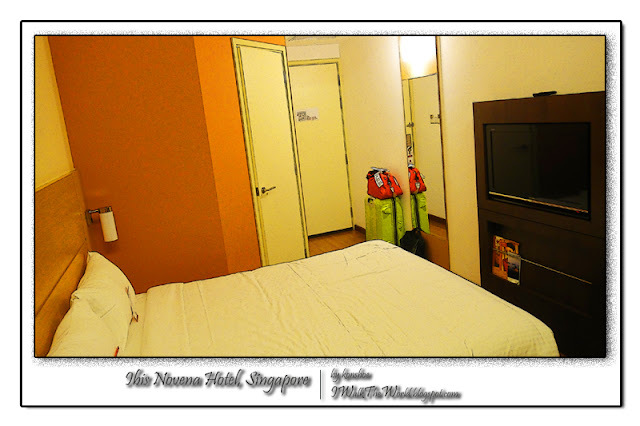 The first point I bring forth is one against Ibis Singapore Novena Hotel though - the available floor space. At first glance, the room looked spacious, with high ceilings as well as tall window panes. But the fact is that taking a circuit around the room and placing your luggage open will tell you how much space you really had. 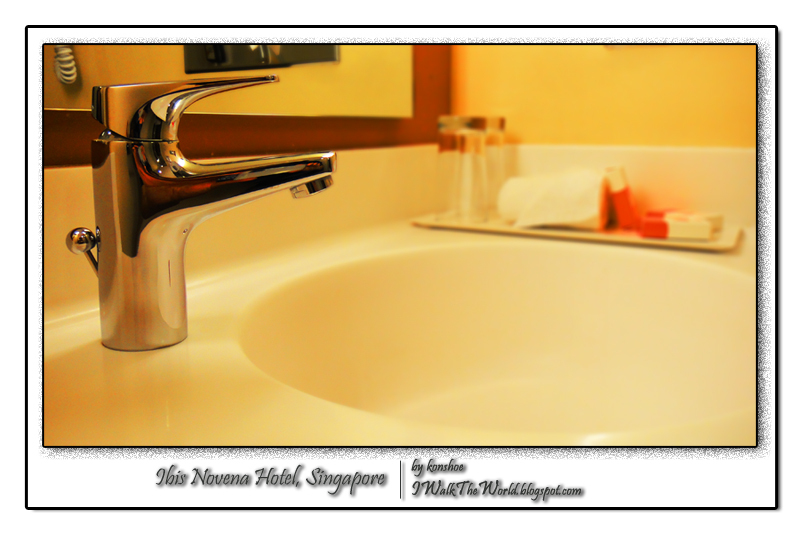 Ibis Singapore Novena Hotel greets you! A high ceiling and tall window panes impressed upon the visitor of a spacious room. Open your oversized luggage wide and the illusion is dispelled. 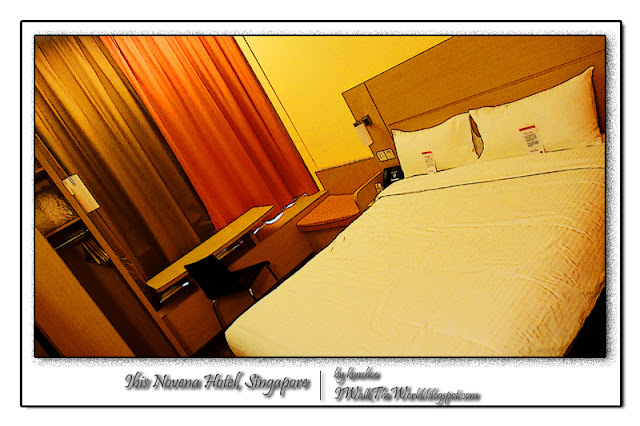 Floor space is at a premium in Ibis Singapore Novena Hotel, just as real estate is in Singapore. Try opening your luggage and you will find that you may need to be careful not trip over it. And the space is right enough for 1 person to walk around comfortably. With kids running around, that could be a little cramped. Not that kids will notice anyway. Still, this little available floor space is what amazes me at the ability of interior designers. The aforementioned high ceilings and tall window panes dispelled any claustrophobia by casting an illusion of space. If there aren't much space horizontally, they try to fill it in on the way up. Furniture that stood unobtrusively to one side made more of the floor space available for crossing instead of being ate up by ungainly items. The orange wall marked the boundaries of the toilet and bathroom. Even with limited space, Ibis Singapore Novena Hotel still managed to create a pleasing room and made the best out of its furniture's layout design to be as unobtrusive to the occupant as possible. 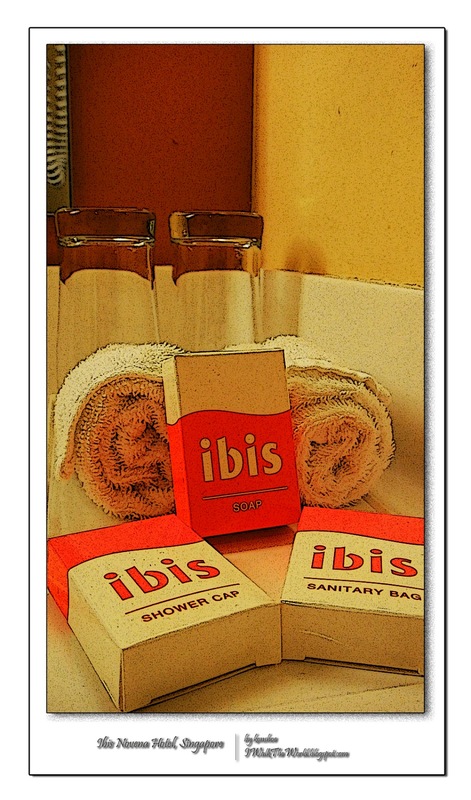 Most hotel rooms carpeted their floor, but Ibis Singapore Novena Hotel greets occupants with a timber tiled floor. Walking barefoot on the floor is a bliss for me, feeling the cool wood soaking up the warmth from my feet after a day's worth of journey outdoors. I never was one who believed in the cleanliness of carpets since it is almost impossible to thoroughly clean them with a vacuum cleaner. With timber floor though, I am at least more confident on walking across them barefoot, presumably that they were cleaned through mops of course. A writing table and a tall wardrobe serves your needs without taking up precious floor space. Notice that the wide windowsills doubled up as a place for placement of items as well. 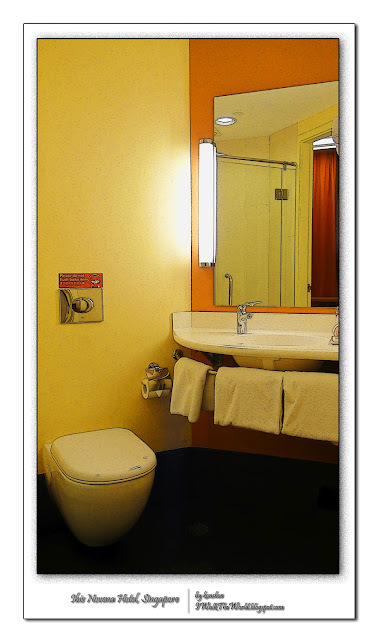 The bathroom, even though not particularly large, is enough to meet the needs of a traveling couple. A standing shower room is essential in space conservation, and leaves enough room for toweling off between the door to the walls and sink. 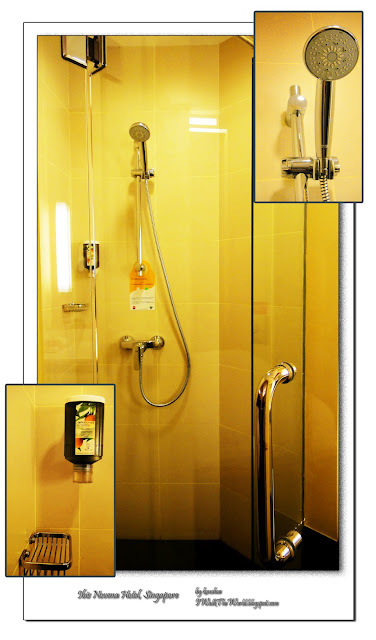 With a standing shower cubicle, Ibis Singapore Novena Hotel built a functional and comfortable bathroom within a constrained real estate. I was particularly entranced with their shower foam, which doubled as shampoo. The fragrance of peach exuded soothing sensation which lingered after you toweled off. A modest-sized basin for your facial and oral hygiene. Between the basin and the shower cubicle, enough space is left to comfortably towel off and change into something comfortable. In a nutshell, a family may fit into the room but luggage will be a problem, especially if an extra mattress is requested and kids are running around. For a couple, this could be something above budget stay but still would accommodate comfortably. Pay no heed to the limited walking space and the rest will meet most travelers' requirements. 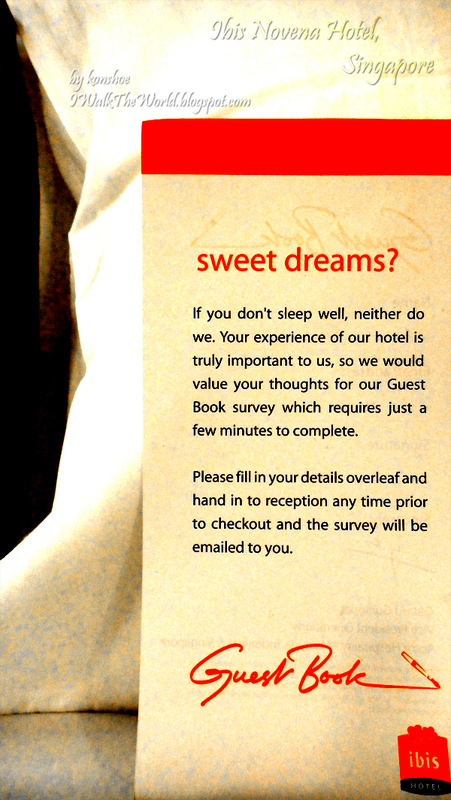 Nobody who goes traveling will want to stay cooped up in the hotel room anyway. 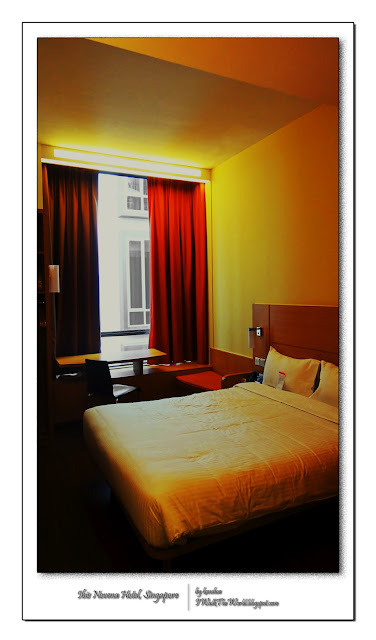 For business travelers though, the complimentary Wi-Fi provided along with your room will be a boon. You could communicate with your colleagues from your original site for additional information or updates on progress comfortably within the writing desk made available for this purpose. So there's the road to Novena, the room of Ibis, what else is left? Interested in what is offered for your breakfast? That will be the next and last part of my experience in Ibis Singapore Novena Hotel. Suitable for: Good for couples or families; comfortably suitable within a business travel's expected accommodation budget. Price: SGD168.00 in general, but dependent on seasons. This amount is not inclusive of Goods Sales Tax. Getting there: Depending on how you wanted to reach there, there are few routes to take. If you are taking a cab, make use of the above address. If you are traveling by public transport, make your way to Novena MRT station located along the North-South line. Look for exit A (look for direction to Tan Tock Seng Hospital if you forgot). Walk along Irrawaddy Road towards Tan Tock Seng Hospital and Ren Ci Hospital. Then pass by a few blocks of beautiful condominiums. The hotel is on your right at the end of the road before ending in a junction. Did I mentioned it will take you 10 minutes? If you do not like walking, make your way to Toa Payoh MRT station. Board for Bus 139 or 145 and get off 3 stops later. You should be able to see the hotel to the right of the bus before it stops at the bus stop. You will need to cross the road and walk back opposite the direction traveled by the bus.